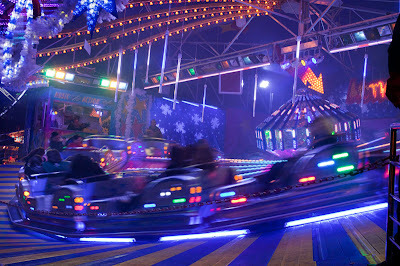 This is not just a whizz of blue colour it is the snow jet ride at Winter Wonderland. I can't believe I actually went on it. I usually stick to something nice and gentle like the ferris wheel! Each year it seems better than before. This year the ice-skating rink is bigger and fabulous right in the centre. Rides, food, Xmas stalls, music, all in all just a heap of fun. All that, and it's not even December yet. As an Old Humbug, I'll stick with ignoring Christmas until mid-December. This makes a great shot. You are a brave one going on this. I tend to stay away from anything that goes in a circle at high speed. I wouldn't go on it! Cool shot though. Ha! I was there yesterday evening :-) Didn't go on any rides though... brave you! Look like a wild ride and a fun place to visit, I wish I could hop on a plane and cross the pond to see it myself! I've never had the nerve to go on whizzing things and lights like this would un-nerve me - so this is a photograph of bravery! Really lovely capture of the moment. Hectic. I like the way you've captured the action. Very nice. That's a great shot, captures the colours beautifully. I can't wait to go pay a visit myself!